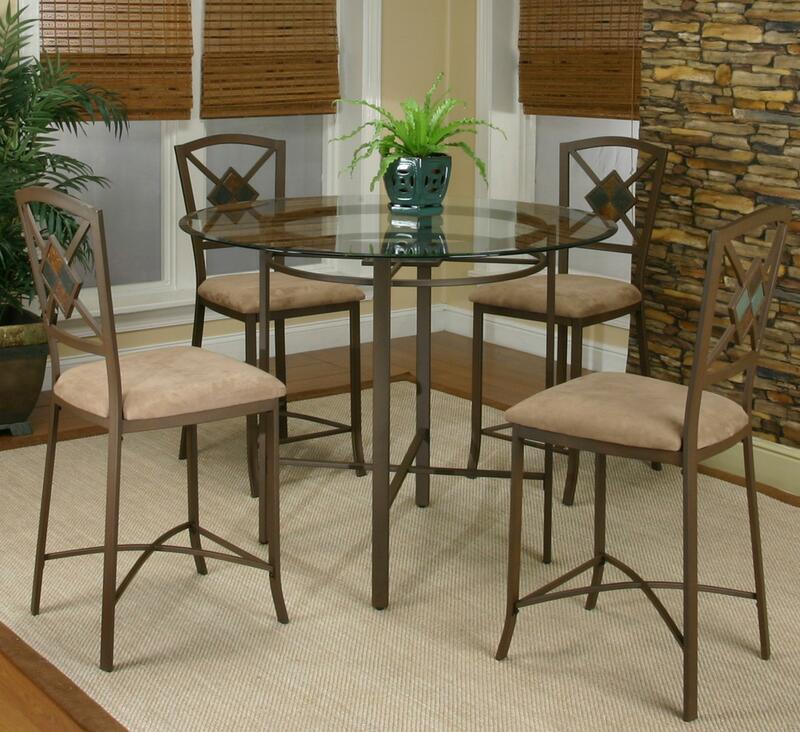 You'll have the perfect place to gather with friends and family with this pub table and stool set in your home, The round counter height table carries an antique bronze finished base as well as a beveled glass top, which provides your room with greater depth. 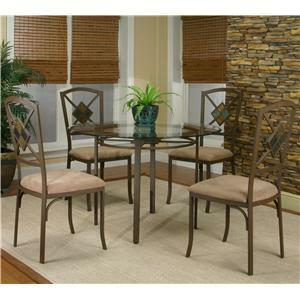 Plus, the center of the table comes with a stone grout slate, adding an artful flair to the overall appearance. Meanwhile, the matching stools comes with a cream-colored microsuede seat and "X"-shaped back with a stone grout slate, which provides an artful quality. 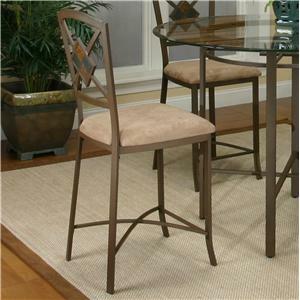 Make your kitchen or dining room complete with the addition of these counter height table and stools. 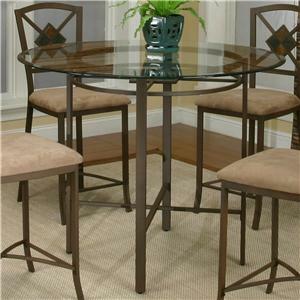 The Cramco Trading Company - Piazza Counter Height Table w/ 4 Stools by Cramco, Inc at Value City Furniture in the New Jersey, NJ, Staten Island, Hoboken area. Product availability may vary. Contact us for the most current availability on this product. 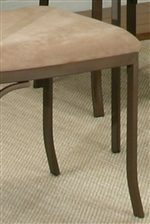 Arm Chair Info The round counter height table carries an antique bronze finished base as well as a beveled glass top, which provides your room with greater depth. 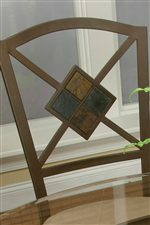 Plus, the center of the table comes with a stone grout slate, adding an artful flair to the overall appearance. 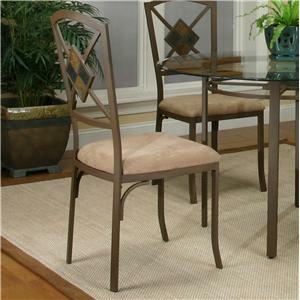 Side Chair Info The piece carries an antique bronze finish with a cream-colored microsuede seat. Plus, the "X"-shaped back comes with a stone grout slate, which provides an artful quality. The Cramco Trading Company - Piazza collection is a great option if you are looking for Transitional furniture in the New Jersey, NJ, Staten Island, Hoboken area. 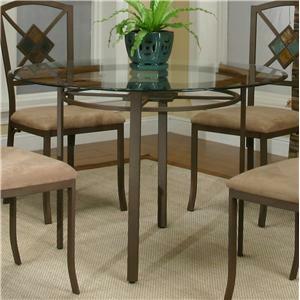 Browse other items in the Cramco Trading Company - Piazza collection from Value City Furniture in the New Jersey, NJ, Staten Island, Hoboken area.